City Council Passes Bill That Could Target Kapalama Canal Encampment UPDATED: Honolulu leaders approve two homelessness bills, including one that would again expand the sit-lie ban. Mayor Kirk Caldwell says he’s unlikely to sign one of them. The Honolulu City Council on Wednesday approved a measure that bans camping or putting up tents along “city-owned streams” if doing so creates a public health or safety risk. 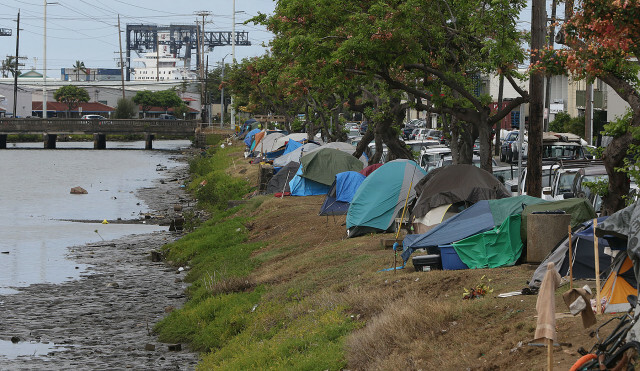 Bill 46 was sponsored by Councilman Joey Manahan, whose district includes Kapalama Canal — the site of a burgeoning homeless encampment with more than 50 tents. Also Wednesday, the council signed off on another expansion of the city’s controversial “sit-lie” ban, a series of ordinances prohibiting people from sitting or lying on sidewalks and in pedestrian malls. Introduced by Councilwoman Carol Fukunaga, Bill 44 applies the sit-lie ban to two malls — College Walk Mall and Kila Kalikimaka Mall — in her district’s Aala area. A growing homeless encampment along Kapalama Canal could be affected by a bill the City Council passed Wednesday. Both measures were adopted on 7-2 votes — with council members Brandon Elefante and Kimberly Marcos Pine in opposition — despite lingering concerns that they won’t pass constitutional muster. Jesse Broder Van Dyke, communications director for Mayor Kirk Caldwell, told Civil Beat that the mayor is “unlikely to sign” Bill 44 because of its legal vulnerability. But Caldwell is in favor of Bill 46 and “intends to sign it, pending a final legal review,” Broder Van Dyke said. The Housing Now Coalition also delivered a letter to state and city officials to urge them to halt the sit-lie expansion and make affordable housing their top priority. But, even before Wednesday, the City Council’s repeated expansion of the ban was opposed by Caldwell himself. In May, Caldwell vetoed Bill 6, which he said contained “legally flawed language.” He and the Corporation Counsel Donna Leong were concerned that it expanded the ban’s boundary beyond Honolulu’s premier business districts, putting the city into perilous legal waters. In June, the council overrode Caldwell’s veto. “There is precedent that the criminalization of homelessness without adequate shelter space has been struck down as cruel and unusual punishment, and we lack adequate shelter space for families,” the center wrote. “As long as they’re doing that, we have no choice but to legislate more sit-lie,” Manahan said. Kamana’opono Crabbe, chief executive officer of the Office of Hawaiian Affairs, expressed concerns in his written testimony that Manahan’s bill regarding streams could affect “numerous constitutionally recognized Native Hawaiian” activities. “There are a number of Native Hawaiian traditional and customary and subsistence harvesting practices relating to streams and estuarine areas, which may be inadvertently impacted by this measure,” Crabbe wrote.